If the public spectacle of allegedly pro-family, pro-morality, pro-ethics, pro-absolute truth evangelical Christians unashamedly and unequivocally supporting a Supreme Court nominee with multiple, credible criminal accusations against him hasn’t killed irony forever and ever, then perhaps my experience yesterday will put us over the top in the war against irony. Irony, brace yourself for what follows. I’ve been working on a grant application with an October 1st deadline. The grant is highly competitive, but securing it would significantly help cover the costs of deeper research into the impact of digital devices on spirituality for my book Always Present: Contemplative Resistance to Digital Distraction. On the due date of the grant, we had to make a few changes to the grant, changes that would make it stronger, but each change brought other changes and renewed complexity. Text messages and emails throughout the day were essential for keeping everyone on the same page. Before I say anything else about my day, the focus of this grant project is studying the impact of smartphones on spiritual practices, and part of the project includes an experiment where we ask some subjects to increase smartphone use, some to decrease, and others to keep it the same. I didn’t anticipate that applying for this grant would inadvertently turn me into a test subject! It just so happened that over the weekend, I had updated my iPhone to the latest operating system, and it includes a “Screen Time” section under Settings. You can set limits on certain groups of apps and see how much time you spend on those groups of apps. You can also track how much time you spend on specific apps. Adding to the complexity of the day our grant was due, our kids were on fall break from school. Part of my screen time involved reading articles at The Athletic while our daughter fussed over her bottle, including several stretches where I put the phone down with an article open. I was also managing several emails and text messages while building boats out of Legos with my boys. All of this is to say, I wasn’t shocked to find at the end of the day that I had spent a little over two hours on my phone. Certain aspects of the day demanded it. We got the grant done, and there are big plans to build some more boats the following day without so many interruptions. However, I don’t want to merely make excuses for myself. This kind of day was full of the unusually urgent, but things can start going off track. Did I Train Myself to Use My Phone More? The problem with such “exceptional” days, addicting tools like smartphones are designed to be rewarding and to appear useful, if not essential. I can begin to use an exceptional day as a baseline for new habits, checking on my phone or seeking distractions with more regularity. For each day where I’m immersed in my phone for a work project, I need at least another day to disconnect from it. Even this morning I caught myself pulling my phone out to check my email… at 5:30 am. There can’t be any urgent messages about the grant at 5:30 am, can there? Did I Pray During My Busy Day? As you can guess, prayer was hard to come by with a baby sputtering each time I gave her a bottle, constant emails and text messages, and my kids asking me to help them find Lego pieces or disconnect pieces that were stuck. Prayer isn’t easy with kids around under normal circumstances, so toss in a competitive grant deadline and a smartphone, and it’s not looking good. However, I was grateful for the chance to see what increased smartphone usage did to my spirituality. That is the point of our study after all? I caught myself getting impatient with our kids when they were bickering. When I had a moment in the car by myself later in the day, I took some time to pray in silence rather than turning to a podcast. I could tell that my soul was unsettled. When I sat down at a café to work on the final details of the grant, I took a moment to pray because my mind was scattered. After hitting send, I took five minutes to close my computer and to write a few thoughts in my journal. It was reflective, but it also felt like a prayer of sorts. Later that evening, I took a break from the dishes to sit with my wife on the back patio while our kids took literally every book off two book shelves in the other room. It was worth it. After spending two hours on my phone on a busy day, it’s not surprising to conclude that prayer was hard to prioritize. 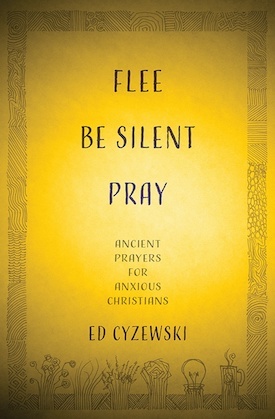 Can Contemplative Prayer Practices Help? While I feel like I need a bit of recovery time today to get myself into a better spiritual and mental place after yesterday, it was encouraging to see that regular contemplative prayer practices have helped me establish a new baseline of sorts. I sort of know what it feels like to be spiritually grounded, and I sort of know what it feels like to be spiritually adrift. I have invested enough time in prayer practices that I knew when things were going off the rails. Having some simple charts and stats about my smartphone usage was also extremely helpful. I couldn’t lie to myself. Let’s be honest, I would totally underestimate my phone usage if it was up to me! Most importantly, even though I had lost a lot of time and space for prayer yesterday, I still had enough self-knowledge and enough practices handy that I could turn a five-minute car ride into a moment of semi-stillness before God. Mind you, those five minutes of silence after a day of perpetual mental and physical motion were AGONIZING. I wanted to keep moving, to keep my mind humming with stimuli rather than turning toward God in silence. I dramatically increased my smartphone usage, and while it wasn’t good for me, contemplation was able to help in the thick of it. In the days to come I’ll continue to use that little screen time chart and my prayer practices to help me keep my feet on the ground.